Well, sure enough, I didn't get out as planned. The snow rose up over the banks big time. At least we weren't on the highway in the midst of the blizzard trying to reach an airport that was closing and then end up stuck in the snow. It was bad out there! The stress of it all really gets to me though. I feel as though I walked to New Jersey. In the deep snow. I banked some valentines posts for you and might as well start sharing them. This is a little heart I made way back when. Still love the simple sweetness. I called them Linzer Hearts because they made me think of cookies. Snippets of a felted sweater, a piece of reclaimed skirt lining, ribbon and a button. Sew through all layers and add a pinback. Visit Kate for a cute valentine idea I just stumbled on. Love her cleverness and what she did to repurpose that pretty calendar. Okay, off to shovel a bit more. Wish me luck getting out of here. At some point, it just might go my way. All packed up, ready and waiting to go off to LA tomorrow. Unfortunately, the snow is piling up again and the airport delays are too. Old man Winter, you're mighty hard to love! No valentines for you this year! Insanely cold here as it seems to be nearly everywhere. 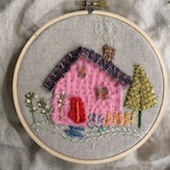 I'm staying warm using my needle, thread and hoop. And today I'm packing for California! I haven't said much yet about Art is You, but I'm teaching the Love Banner project (and the House Keeper) again there next fall in Connecticut. Sallianne just wrote to say that anyone who has already registered and anyone who registers from now until midnight on January 31st will go into a draw to win back their complete registration. So, do check out the event and sign up soon to get in on that. Like those crafty squirrels, it's good to plan ahead! With my morning coffee at the keyboard, the first stop is often here. It inspires me in about a thousand different directions every day with multiple posts and great ideas of all kinds. Look at this! Simple tools, materials and design. Don't you just want to drop everything and make some? Yes! I wasted no time cutting up a box in the garage and made my 2 minute valentiney version of their fantastic postcard idea. I've been enjoying these cold snowy days. Almost there with the last details on this sampler. Now I'm just fiddling with little add-ins and fixes. Thank you for the thoughts and suggestions about the pup. I knew I could count on you. As suggested, he has dots, knots and spots! We had more snow last night. Lots. Before I run out there to shovel, I made something to share with you. As promised, it isn't about stitching. Well, it does involve a threaded needle. There are lots of ways to change this up depending upon what you have handy. I used some of my fav white wool blanket, a previously cut-up cotton pillowcase, black and white thread, a needle and a piece of book paper. A little white glue and scissors also. Cut three sets of snowman disks from both wool and cotton. Smaller for head, then the middle and the larger base. With black thread, stitch a face onto the smallest wool piece. (I begin with the eyes, then the mouth and the nose last.) Thread a needle with a generous length of white thread and start at the bottom of the biggest snowball. Use a simple running stitch to go straight up through all 3 sets of disks with a little stitch hop from one set to another. That way it will spin like a mobile. Cut 2 sticky arms from the book paper and 2 hat shapes. With a tiny smudge of white glue, slip the arms between the middle disks. Add the hat shapes to the front and back of the head the same way. Use the thread length to suspend him high above a heat source like the radiator. The heat waves will make him twirl. So- to the questions. I like to use pearl cotton (coton perle). Always have preferred it because as a kid/beginner I hated splitting floss and always tangled it up. Somewhere I picked up a bag of pearl cotton and instantly loved it- the texture and luster of the thread, the way it comes off a spool so nicely, the way it behaves. Fewer tangles, easier to stitch with, less to fight. On the other hand, I've also found that it doesn't fill as well. It sits up on the fabric whereas floss flattens out more to fill the space. I use DMC sz 8, but every now and then, I use a heavier gauge because I buy the old thread bundles at church sales and like to work it in sometimes. A really fat thread adds some interesting forms. I haven't found an online source for thread yet. I just stock up when I see it. Sorry, that doesn't really help much, does it? Let us know if you have a good online source for thread. And then, how do I choose the colors? Thinking about that this week some. Looks like I put a "family" of basic colors in a bowl or basket (or ziplock bag for the travel projects) and then add a few more secondary colors. Almost always I whittle it down to 3 or 4 core colors and try to balance the design with some of each on all parts. Does that make sense? One more thing. I learned from my awesomely brilliant stitching friend, Rebecca that stitching on lightweight cotton works better with two layers of fabric. The sloppiness of the backwork doesn't show through and the double thickness makes everything sturdier. For the back, I use pieces from old cotton pillowcases. Makes it harder to get into the hoop sometimes, but I've decided it's worth the struggle. Hoping that helps. Some of you know way more about stitching than I will ever know. Feel free to share that info here. I'm self-taught, terribly impatient with technique (thread-splitting) and more than a little unfocused these days. But I'm having fun. Are you? I'm kind of craving color now that it's winter full-on, snow, slush, gray, cold, dreary. The palette volume gets turned up one day, then quiets down on another. Up pretty high right now. Dragging my stitch projects wherever I go - home and away. This is one of two I'm working on. Love it and LOVE the colors! In the Etsy description, I mentioned that I finished the cuff in two episodes of Law and Order. Think I've worn it every day since. It matches my studio lantern and my studio robe - imagine that! In my new Super Stitch mode, I've joined a few Flickr stitch groups and so enjoy having those new places to visit. I was pretty excited and honored to be included here as one of many in a fantastic holiday round-up. Lots of inspiration for all kinds of ways to use the needle and thread out there. At the end of the month I'm heading out to California and teaching that Love banner art quilt class at French General. It sold out really fast so Kaari added some spots (still open I think) and I'm expecting an extra big group which will make it all more fun! Picking and packing things to ship ahead for the LOVE stash pile to share. Turns out I'll be teaching the class again on this side of the country in CT next fall. Details on that event and all the incredible classes and teachers are here. I think registration opens up any day now.